"PixelFinder Delivers Wonders." , critics said. With DVI output, PixelFInder presents PS3 ouput on a regular computer monitor, projector, LCDTV, HDTV and any good size display device that is pixel based. It can also transform a regular DVD player into a highend DVD player that delivers 1080p without using pricy Bluray or HD DVD discs. See DVD improvement. 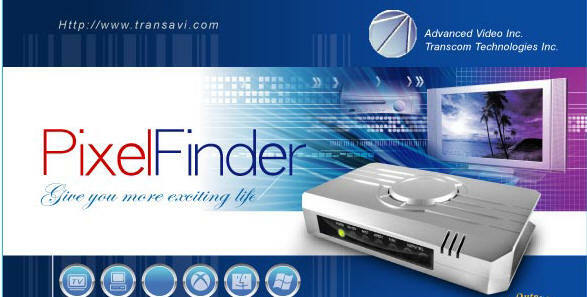 "PixelFinder is the savior in HD world" the High Definition Audio Video Fidelity Chief editor praised. "PixelFinder is a poor man's best HD solution" Popular Electronic European Edition editor wrote. PixelFinder transforms a regular computer monitor into a HDTV monitor. PixelFinder transforms a projector into a HD digital projector. PixelFinder transforms a LcdTV into a HDTV. Revive a PDP in the HDTV era. PixelFinder transforms a HDTV into a high resolution computer monitor. PixelFinder is a video acrobat. 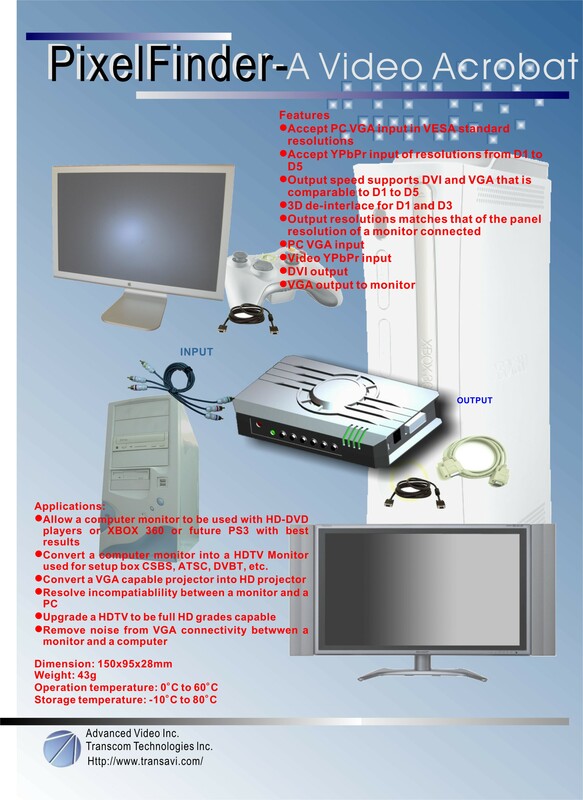 There are as many formats to deliver video signal to a monitor as there are variations in frequencies as well as resolutions among computer monitors and among high definition (HD) TV monitors. PixelFinder translates video sources of all these variations to a type that can be rendered specifically on a user’s monitor in an optimum manner. PixelFinder finds the pixels on a display panel for a computer or a HD TV for images rendering purposes. 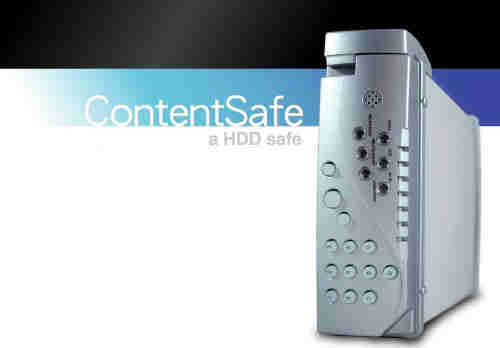 The HD contents as in games and video are meant to be rendered on a HDTV. With the high definition contents seem to be finally upon us in a significant way, there is an urgency to find the pixels to display the high definition video images. Depending on HDTVs for everything that is HD seem to be a rather expensive undertaking for everyone. HDTV monitors are pricey despite their prices have come down recently. There should be a better way to welcome the arrival of the HD ages. We have created the PixelFInder to locate the pixels in a monitor, mostly in a computer monitor, that is affordable and sufficient to be the equivalent of a HDTV monitor. As a matter of fact, with the majority of HDTV on the street today only support full 720p and scale down 1080i, PixelFinder is a much more powerful HD delivery agent especially when new computer monitors are coming out with brighter and faster panel rivaling that of a HDTV. PixelFInder has a complete HDTV engine that is coupled with a processor to negotiated with a typical computer monitor. PixelFinder sits right outside a computer monitor or a HDTV. PixelFinder takes in HD from D1 to D5 component and VESA from 800x600 to as high as 1920x1200. And it can scale the input to an output in VESA or DVI from 800x600 and up to 1920x1200. It also performs de-interlace for D1 and D3 so that the image comes out smoothly no matter which video source is involved. Any input is analyzed and enhanced in color and image stability for the output to an attached monitor. This is the only box in the world that can do all of these and it is patent pending in USA and other counties and regions. For a computer monitor, PixelFinder allows a computer monitor to function as a HDTV monitor to take in component video signal with high definition images. For a computer, PixelFinder allows new monitor to be used with an existing computer with improved in display quality and sometimes compatibility. For a game box, PixelFinder allows a game box such as XBOX360 to be played on almost any regular computer monitor, Apple moniotr included, with high definition images. For a HD cable service, PixelFInder allows a subscriber to purchase the HD services from cable company without paying big money to acquire an HDTV monitor. For HDTVs, PixelFInder can upgrade those with D3 or D4 capability to D5 or beyond. For a projector, PixelFinder transform a non-HD projector into a HD capable HDTV monitor. For an Apple monitor, PixelFInder allows an Apple monitor to be used with any PC. Panel Resolution EDID YPbPr HDMI/DVI LikelyModeYear App. User to set input video resolution. The following displays devices are certified to use the products. For those are not listed will work just fine in most cases. Any monitor manufacturer wish to be included in this list can contact AVI or TTI. An updated version of this table is available on the website http://www.transavi.com/. Other interface supports such as HDMI in input and output are in the version of the PixelFinder II. YPrPr output is also available upon request. is consisted of Transcom ownproduction facility as well as contracted production lines from BTC (Behavior Technology Corporation), Taiwan. The total production output is 10k monthly and can be expanded with additional product lines if needed.